Mysore, the former princely state is today the second most populous city in the state of Karnataka, with a population of close to 1 million. The city which is known for its history has seen sustained growth over the last decade or so, with a number of people moving to it from bigger cities. Improved infrastructure and job opportunities have seen an improvement in the overall quality of life, which in turn has resulted in an increase in the number of vehicles in the city. As of 2013, the city had over 5 lakh vehicles, with two-wheelers accounting for over half of these. On an average, around 100 two-wheelers are registered in the city each day. Given these numbers, there have been a number of accidents in Mysore, often resulting in loss of life. The Indian government has made it mandatory for all vehicles to have a valid insurance policy. A good two-wheeler insurance policy can help offset losses during an accident. Failure to have a policy can result in the traffic police taking action, with traffic cops releasing such vehicles only after the owners purchase a new insurance policy. Mysore is a key city in Karnataka, with almost all general insurance companies offering two-wheeler insurance here. Individuals looking to purchase an insurance policy for their bike can consider the following options. Finding a garage which is trustworthy and affordable can be hard, especially in smaller cities. Individuals who have insurance can utilise the services of cashless garages in Mysore, with almost all insurance companies offering this added service. These network/cashless garages can be a boon for those involved in accidents, with a majority of people choosing to get repairs fixed here. A policyholder can use the following methods to locate a network garage in Mysore. Log onto the official website of the insurance provider and search for all network garages in the city. This is the simplest way to locate them, with all major insurance companies providing this option. One can also contact company care representatives and ask them to provide a list of all network garages in the city. If the individual purchased the policy through an agent, he/she can be asked to provide relevant information about cashless garages. It is possible to find information pertaining to cashless garages in the brochure of the policy. Certain third-party websites provide information about cashless garages associated with a particular insurance company. One can use the app of the insurer and locate a network garage through this. Faster – Network garages typically fix damages quicker than regular garages. This ensures that one needn’t rely on alternate modes of travel for an extended period of time. In certain cases regular garages tend to take weeks to get damages fixed, which can be avoided with cashless garages. Professional – Finding garages which are professional is hard. Most of them do not adhere to timelines, often delaying the delivery of the bike. This, however, isn’t the case with network garages. Expert technicians and mechanics are hired by them, improving the quality of workmanship. Quality – One can be rest assured that all damages are fixed using quality spare parts. Getting a vehicle fixed at a local garage comes with its share of risk, with it common for fake parts to be used in a number of cases. This isn’t the case when it comes to network garages. 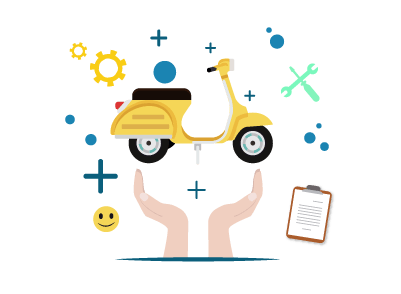 Additional services – Cashless garages offer add-on services like roadside assistance, towing, doorstep delivery of bike, etc. Limited spending – When a bike gets repaired at a cashless garage it is the insurer who settles the bill. This eliminates the need to make out-of-pocket payments. An individual might be required to pay an amount only if the bill exceeds the cover amount. Ease of use – Utilising the services of a cashless garage is simple and easy. One needs to inform the insurance company and provide a few basic documents. The insurance company will handle all communication with the garage, eliminating the hassle of negotiating repair costs, delivery time, etc. Replacement – It is possible to get a replacement bike while the damaged vehicle undergoes repairs at a network garage. This can vary from insurer to insurer. A number of us purchase a bike insurance without doing the requisite amount of homework, which can come back to haunt us during an accident. With a number of options out there, it is imperative to consider the following points before selecting a policy. Cover type – There are two cover types when it comes to two-wheeler insurance policies. While the Liability-Only cover is mandatory, the Comprehensive Cover is optional. The cost of a comprehensive cover is more than a liability-only cover, but given road conditions in the country it is a smarter option to purchase a comprehensive policy. Policy term – Most bike insurance policies come with a term of either 1 year or 3 years. Opt for a term which meets your expectations. A longer term can eliminate the hassle of periodic renewal, in addition to being cheaper. Deductible – A policyholder might be expected to pay a certain amount in case of a claim. This is termed the deductible, with it being a voluntary choice. The higher the deductible the lower the cost of the policy and vice versa. Claim limit – Insurance claims are subject to a limit. Check this before deciding on a policy. These limits are capped based on the type of policy chosen and the IDV of the bike. Premium – Ensure that the premium for the policy is affordable. It is possible to get a better offer on premium by comparing policies. Additionally, individuals who have a No-Claim Bonus are entitled to discounts on the premium amount. There are a number of factors which impact the premium, including the engine capacity of the vehicle, area of registration, age of vehicle, etc. Claim settlement – Ensure that the insurance provider has a good history of claim settlement. Choosing an insurance company which has no dedicated team to handle claims can result in delays, often increasing tension and anxiety. Inclusions/Exclusions – Ensure that all terms and conditions are read. Each policy comes with a host of inclusions and exclusions. Choosing a policy without understanding these could result in making the policy useless. Network garages – Choose an insurance company which has a presence in the city where the bike is intended to be used. Ensure that they have a decent number of network garages. Choosing an insurer with a limited number of network garages might not be the best option. Mysore is home to a number of big companies, with these organisations employing thousands of people from different parts of the country. As such, it is possible to see vehicles registered in different states plying on the roads of Mysore. Individuals who wish to buy/sell such vehicles can do so without any hassle. They are, however, expected to transfer the insurance policy after the bike has been sold. This transfer can be done by following these simple steps. The seller is expected to inform the insurance company after the vehicle has been sold. Details of the sale should be provided to the insurer. These include documents like the NOC, registration certificate, sales deed, etc. The buyer will have to submit his/her details to the insurance company in order to facilitate transfer of the policy. The buyer is expected to pay any fee (if applicable). Once all formalities are complete the insurance company will transfer the insurance policy to the buyer.